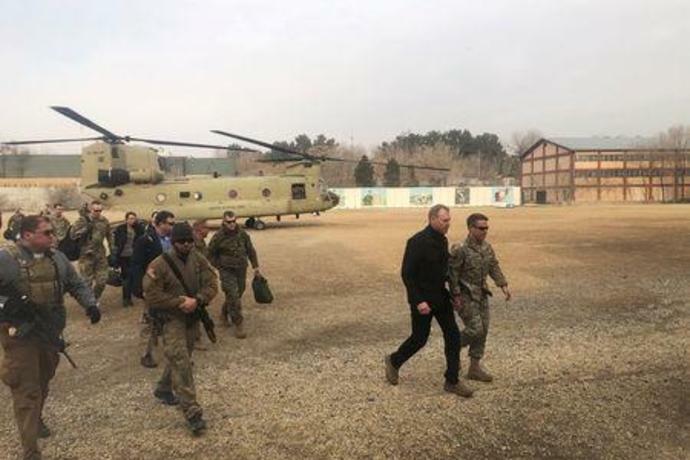 KABUL (Reuters) - Acting U.S. defense secretary Patrick Shanahan arrived in Afghanistan on Monday and said it was important the Afghan government is involved in talks, from which it has so far been excluded, to end the 17-year-old war. Shanahan, who will meet U.S. troops and Afghan President Ashraf Ghani on his first trip in his new role, said he had so far not received any direction to reduce the nearly 14,000 U.S. troops in Afghanistan. He also said the United States had important security interests in the region. Ghani's government has been shut out of the evolving peace talks between Taliban negotiators and U.S. envoys, with the hardline Islamist movement branding his government a U.S. puppet. Kabul is also concerned that a sharp drawdown of U.S. forces could lead to chaos in the region. "It is important that the Afghan government is involved in discussions regarding Afghanistan," Shanahan told a small group of reporters traveling with him on the unannounced trip. "The Afghans have to decide what Afghanistan looks like in the future. It's not about the U.S., it is about Afghanistan." Shanahan took over from Jim Mattis, who quit in December over policy differences with U.S. President Donald Trump. He said he could not make any guarantees because U.S. peace envoy Zalmay Khalilzad was leading the talks. "The U.S. military has strong security interests in the region. (The) presence will evolve out of those discussions," Shanahan said. He also said his goal on the trip was to get an understanding of the situation on the ground from commanders and then brief Trump on his findings. U.S. officials have held several rounds of talks with the Taliban in Qatar since last year in what is widely seen as the most serious bid yet for peace in Afghanistan since the Taliban were ousted by U.S.-backed Afghan forces in late 2001. Both sides hailed progress after the latest round last month, although significant obstacles remain. Those include the involvement of the Afghan government. The next round of talks is due in Qatar on Feb. 25. Mattis, a former four-star general once in charge of U.S. Central Command, was respected for his deep knowledge of military and global affairs. Shanahan, a former Boeing executive and Mattis' deputy, is seen as a relative outsider in foreign policy circles. Afghanistan and neighboring countries are also concerned about the effect of a sudden withdrawal of U.S. forces on the region. An Afghan official, speaking on the condition of anonymity, told Reuters that even the suggestion of U.S. troops leaving was dangerous. Trump has offered no specifics about when he would bring home the 14,000 U.S. troops in Afghanistan but has said progress in negotiations with the Taliban would enable a troop reduction and a "focus on counter-terrorism". Shanahan said a withdrawal of about half the U.S. troops in Afghanistan was not something that was being discussed and he had not been directed to reduce troop numbers. "The presence we want in Afghanistan is what assures our homeland defense and supports regional stability and then any type of sizing is done in a coordinated and disciplined manner," he said. Khalilzad said after six days of talks with the Taliban in Doha last month the United States and the Taliban had sketched the outlines for an eventual peace accord. He has said since then there had been progress on the future of U.S. troops in Afghanistan. However, the Taliban have put out contradictory information on what timeline the United States had agreed to in any potential withdrawal. Most recently, a Taliban official said no timetable had been agreed with the U.S. government for the partial withdrawal of U.S. forces. U.S. officials have told Reuters that, while no formal orders have been sent, the military is preparing for what a withdrawal of about half of the 14,000 U.S. troops in Afghanistan would look like. Officials have expressed concern that if U.S. troops leave, Afghanistan security forces, already stretched thin, could crumble. Shanahan met with a group of elite Afghan commandos later on Monday and backed using more resources for offensive operations by the special forces. "What we see here today is how capability is being generated and the commitment of special forces to fighting the Taliban," Shanahan said. 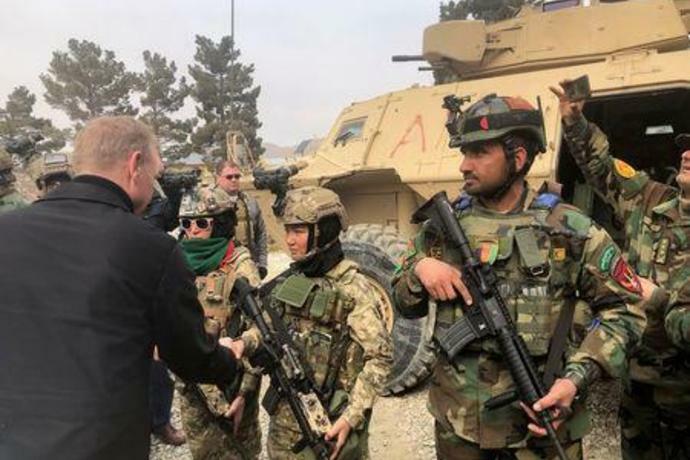 Afghanistan's highly regarded special forces units suffered increasingly heavy casualties last year as the Taliban mounted major assaults on provincial centers including Ghazni city and Farah city in the southwest.